Residing outside of the Benelux, but inside EU? We ship CamFi throughout Europe with DHL Express (2-3 business days). functionaliteit wilt toevoegen van time lapse, stop motion en bulb. 'Met de CamFi heb je een handige afstandsbediening en grote viewfinder voor je camera. 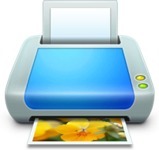 CamFi kan de genomen foto's in real time naar Dropbox sturen terwijl de Fotograaf aan het fotograferen is. Hiervoor is uiteraard wel een externe Hotspot benodigd naar het internet. Stelt gebruikers in staat om meerdere CamFi's via WiFi of Ethernet netwerk te bedienen. Schieten van foto's tegelijkertijd, verzend onmiddelijk de vastgelegde foto's van camera naar PC. scherpstellen en starten van video opname. Deze software is gratis voor alle CamFi gebruikers. Can I use CamFi with my Sony Camera? Can I use a CamFi with the flash lamp or flash trigger at the same time? Putting the CamFi on the hot shoe is just for fixation, it is not necessary to always be on the hot shoe. 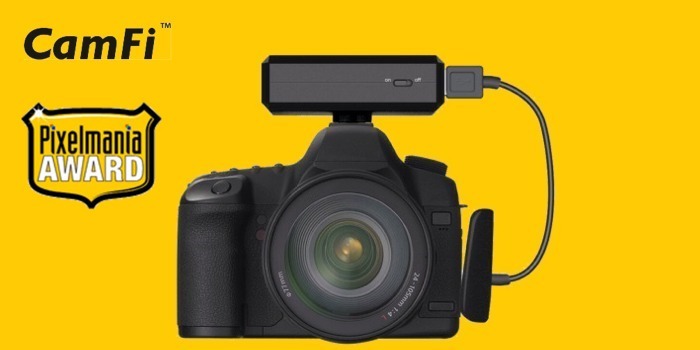 If needed, you can hang CamFi on a tripod or on your wrist, and you can also buy a dual shoe bracket on Amazon, then you can put the flash trigger and the CamFi on the bracket at the same time. How to connect CamFi with PC? 1. Wireless connection. 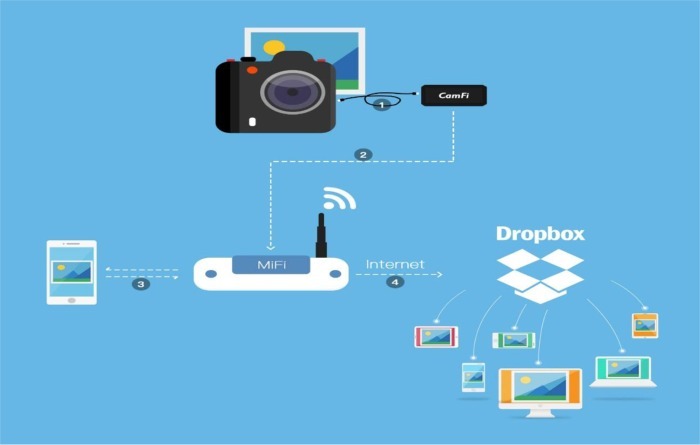 You can connect CamFi to your PC through the CamFi wireless network by using a portable USB Wi-Fi. 2. Cable connection. Connect CamFi to your PC via the LAN cable. 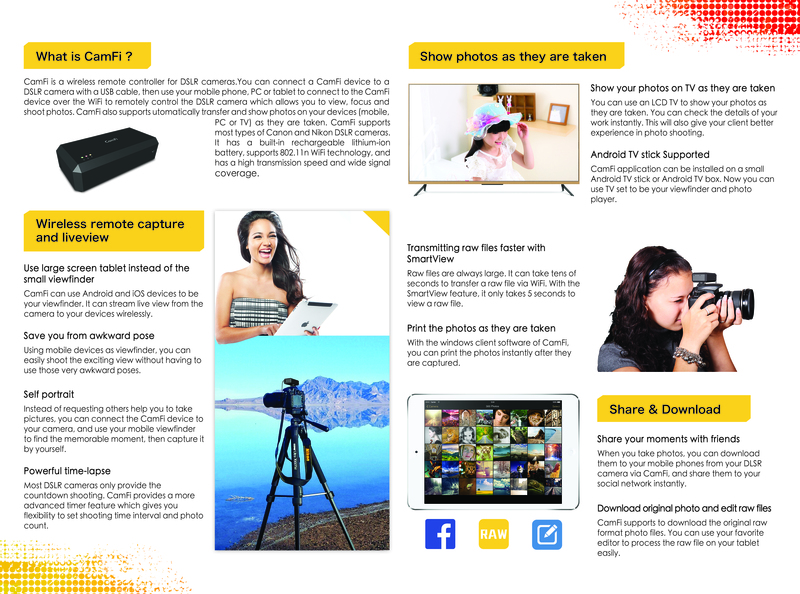 How to receive pictures by using TV? 1. By using a PC or laptop connected to the TV through our PC client to display the photographs in a photo shoot. 2. By using an Amazon Fire TV stick or other android TV stick. After having installed our TV client app, you can use an LCD TV to show your photos as they are taken. Can the photographs be transmitted between the two floors? It is related to the structure of the building because the signal may be weakened through the wall. We recommend that you use the Wi-Fi signal amplifier, or use a cable to connect the devices when the signal is weak. Is there a battery in CamFi? How long can it be used? CamFi has a built-in 1800mAh rechargeable battery and it can NOT be removed. The duration of the battery is more than 6 hours for the normal work. 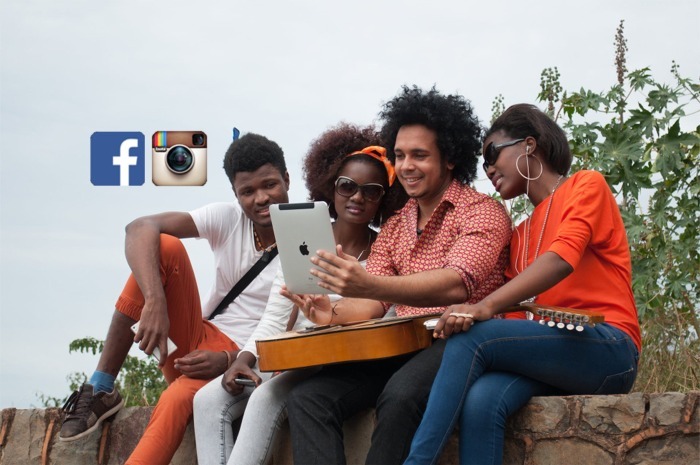 Does CamFi use my mobile broadband? Can CamFi be used for outdoor purposes? How about the transmission distance? 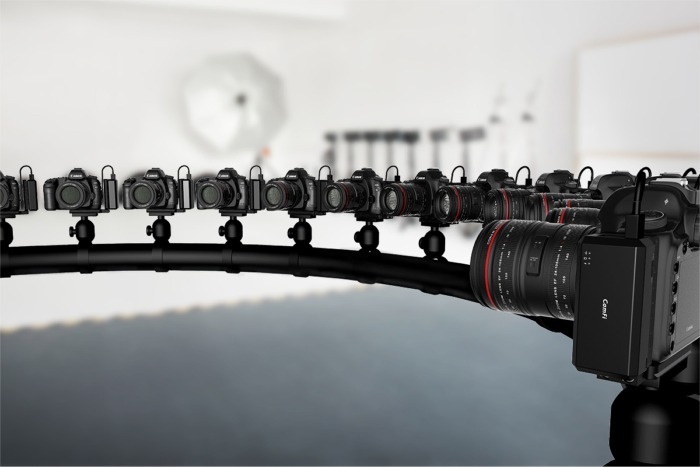 CamFi is a wireless remote controller for DSLR cameras. It is a Wi-Fi transmitter, and as such, it will NOT need your mobile broadband.You can connect a CamFi device to a DSLR camera with a USB cable, then use your mobile phone to connect to the CamFi device over the Wi-Fi to remotely control the DSLR camera, which allows you to view, focus and shoot photos. It supports 802.11n Wi-Fi technology, and has a high transmission speed and wide signal coverage. The Wi-Fi signal can be up to 50 meters in a barrier-free environment. Can I also display pictures on my PC/Laptop? Yes please download the Windows Client software. The software is the same as Android and iOS APP. You should connect CamFi to your PC or Laptop via WiFi or via a LAN cable. Yes, when you download a new distribution of the App, the new firmware is included. Then when you connect to the CamFi with the new App, the new firmware is uploaded to the CamFi for upgrade. There is no need to change the hardware or connect the hardware to a PC. Does CamFi support Video Mode? It will be supported in December 2015. CamFi is working on this. In theory it should work. But CamFi Factory needs to test those cameras in the near future. Please use the USB cable which was supplied with your camera. It should work with CamFi just fine. Ik heb net mijn CamFi in gebruik genomen. Ik voer de voorgestelde update uit. Maar ik krijg nu de melding Update successful Camfi is rebooting... Please wait. Hij lijkt hierin te blijven hangen. Dit heeft waarschijnlijk te maken met de Firmware die op de CamFi unit zelf werd geïnstalleerd. Deze firmware wordt via de APP op uw smartphone/tablet automatisch gedistribueerd naar de CamFi unit hardware zelf. Controleer of de LED lamp op uw CamFi brandt en start de APP opnieuw op. Mocht dit niet helpen, deïnstalleert u dan de APP en installeer deze opnieuw. Kan ik de CamFi uitschakelen en later de gemaakte foto's via WiFi overplaatsen (streamen)? Dit is inderdaag mogelijk en een van de features van CamFi. U kunt de foto's van de geheugenkaart bekijken in de CamFi APP en de gewenste foto's draadloos via WiFi overzetten naar uw smartphone en/of tablet. Can I connect my CamFi into my (wireless) network environment? CamFi can be connected to the network via using a network cable now. But it may cause some issues on DHCP service depending on the configuration of customer’s network. So we don’t recommend to connect into network now, later we will deliver a new release APP to implement the function to manage the DHCP service, so after upgrading the new version, customer can easily connect CamFi to his network via using a network cable. CamFi asks for a Password. But I don't have a password. It maybe caused by someone setting the password by chance. It can be solved by pressing the reset button for 5 seconds. The password can be cleared after the reboot. Can CamFi control the Mirror Lock-up? The Camfi does not control the mirror lock-up directly. 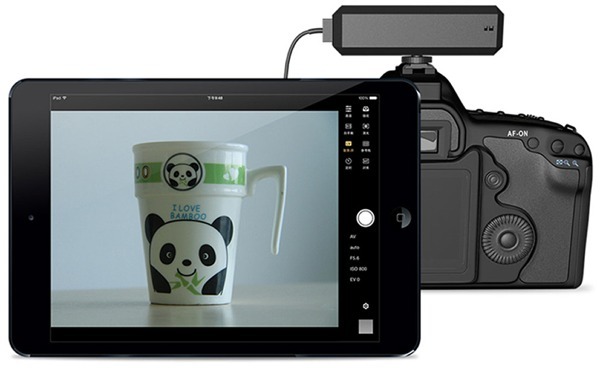 When the user uses the live view on the iPad, the camera's mirror will lock-up automatically. And if the user uses the Auto-view mode, he can set the mirror lock-up with his camera directly. 1. Low voltage. Try to charge the CamFi for 2 hour. Shut down it and restart it again. 2. USB cable. Try to replace with another USB cable.